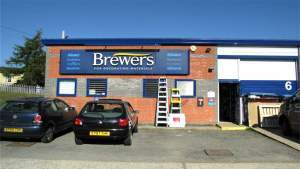 We at Stevenage Brewers Decorator Centre believe you won’t find a better local supplier of paints and decorating materials. We pride ourselves on being the decorator’s first choice and go out of our way to help our customers get the best possible result. In store you’ll find a comprehensive range of trade and designer paints and finishes, tools and sundries, wallcoverings and more. If we don’t carry what you need in stock, you can browse WallpaperDirect and DesignerPaint here in the showroom and just click and collect. We’re lucky to be in the historic Old Town of Stevenage, where the old train station used to be, with the train track just 40 yards in front of us. We’re on the small industrial estate on Orchard Road, via Julians Road from the one-way system. There’s plenty of parking outside and the store is easily accessible for wheelchair users. From the A1155 leading on to Fairview Road, at the mini roundabout, exit on to Julians Road. From Fishers Green Road leading on to Fairview Road, at the mini roundabout, exit on to Julians Road. From Julian's Road, turn right on to Orchard Road, then immediately right in to the Enterprise Centre. From the A602 Lytton Road, turn left on to Orchard Road, then immediately right in to the Enterprise Centre. The entrance to the Enterprise Centre off of Orchard Road.